If you live outside a certain part of the US, the brand BBVA Compass may be unfamiliar to you, and if you are from an area served by BBVA Compass, you may think of them as just one more large, grim banking institution. Thanks to KIPP, that may be changing. KIPP has sold the naming rights to its Houston campus for $1.8 million dollars to the Atlanta-based financial goliath. The school itself will still be called KIPP Nexus, but the campus will be the BBVA Compass Opportunity Campus. This is a new school in the KIPP Houston chain opened this year with 90 kindergartners and 110 fifth graders. It joins the 28 Houston-area campuses and the 209 schools in the KIPP national chain. The $1.8 million breaks down into a million and a half for capital projects and another $300K for operating expenses. This is reportedly BBVA Compass's largest adventure in education financing, with their "director of corporate responsibility and reputation" (yes, that's a thing) praising KIPP's "bar-none" and "spectacular" record of success. This is not the first such venture in the Houston area. The Kinder Foundation (founded by former Enron executive Richard Kinder) sunk $7.5 million in the Houston ISD High School for the Performing and Visual Arts with the expectation that Kinder's name would be added to the title of the magnet school, but after a pushback from board and public members, the foundation released Houston ISD from the naming obligation. Schools and school districts have sold out entered mutually beneficial partnerships with private interests before. There are plenty of school sports stadiums with sponsor names attached, and I suspect it would be impossible to count up the number of schools that use scoreboards which were "contributed" for "free"-- but with the company logo prominently displayed. Charter schools have always depended upon the kindness of well-heeled strangers, though not often at the cost of naming rights. Is sponsorship of education a bad thing? We know that when the Koch brothers endow a college teaching position, they expect that school to teach the "correct" economic world view. But what about K-12? Do we want our kids' school day to feature "Wal-Mart Presents the Spudville Junior High School"? If my child attends Exxon Senior High School, will she be allowed to learn about global warming? If my child's school is sponsored by Hobby Lobby, will she be required to learn that all non-heterosexuals are wrong and evil? IF we're a Disney school, am I forbidden to roll my eyes as I open class with the newest Disney trailer? Sponsorship is a tricky thing-- sponsors might not have to say a word if cash-strapped administrations decide on their own that nobody will be allowed to do anything that might spook the sponsors. And how do these sponsorships do anything except widen the gap between haves and have-nots? In poor rural or urban communities where there are no deep-pocketed sponsors waiting to purchase show their support for schools, will the schools just fall further and further behind? What if we break it down to the classroom level? Does Future Me end up starting the period by saying, "This Tuesday's lesson about participial phrases is brought to you by the folks at Tyson chicken-- nutritional swellness for your every meal." Or will I just play an ad? Must my students all write assignments with a Bic pen (the official pen of Franklin High School)? 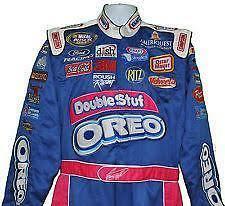 Do I get to wear a special teacher suit that's covered with logos, all NASCAR style? Do I get to negotiate my endorsement deals as a free agent, so that popular teachers get the best extra income by selling out like a soulless bandit entering productive partnerships with private business, or will the district negotiate all such deals so that I can look forward to a principal shoving a Pepsi logo hat in my face and saying, "You will wear this, or I'll put a letter in your file." Mike Fe9niberg, co-founder of the KIPP conglomerate, says that the alternative id for corporate America to ignore K-12. I disagree. The alternative is for corporate America, along with the citizens of America, to pay a fair share of taxes to properly finance public education. Crazy talk, I know, but at least you can believe I mean it, because I have no sponsors paying me to say it.